The Hayt Golf Learning Center (HGLC) at UNF is a great place to learn to play golf, spend time before class, or relax after a hard day at work. Whatever it is that brings you to the HGLC, you can be assured you will leave having had a pleasant experience. The HGLC is a great place to learn how to play golf. Professional instructors are there to help teach a beginner golfer how to golf properly. Whether you are a junior golfer or an adult golfer, the HGLC has programs for either. Instructors provide private lessons for those golfers who want one-on-one training and they provide group lessons for those golfers who learn better watching others. When you have time before class, the HGLC is a great place to come. You can grab a bucket of balls; take it to the practice range or you can practice putting on their putting greens for as long as you want, or until they close. You can play the center’s four-hole course, unlimited times that day, after only paying once. The best part of coming to the HGLC is that it is located on campus so you are not far from your classes. The HGLC is for people of leisure. The center has a small bar area that offers a couple beers on tap and the staff keeps some domestic and imported beer in a refrigerator for sale. The center also provides free WIFI if you just want to stop by and check your emails while watching others golf. There are televisions for customers to come in and catch a sporting event or any other television program. You could go to the HGLC after a busy day, prop your feet up, with a beer in one hand and a remote in the other hand, and relax. The Hayt Golf Learning Center is not just for golfers, it is for anyone who wants to have a good time. It is open seven days a week. The practice range is opened a little later on Sundays because it is lighted. 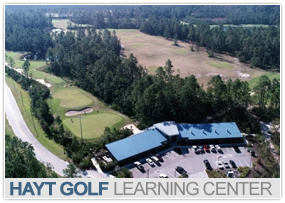 If you want to learn more about the Hayt Golf Learning Center please contact them at (904) 260-2050.